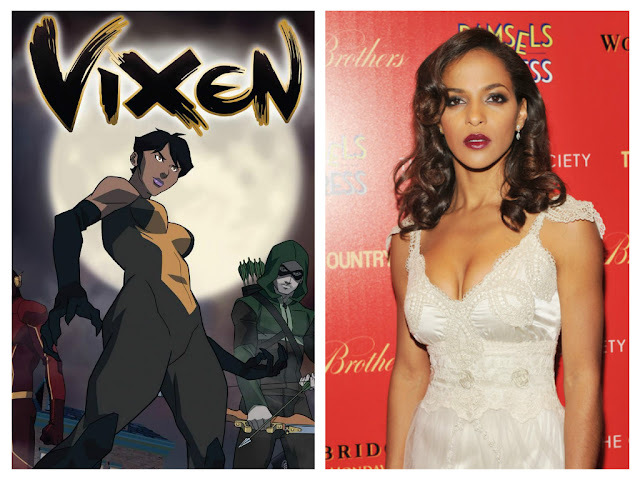 After the announcement of an animated short series on The CW's digital channel, CW Seed, back in January it seems we're finally getting some more details about Vixen. Megalyn Echikunwoke (The Following, House of Lies) has been tapped to provide the voice for Mari McCabe who receives magical powers from a mysterious totem inherited from her deceased parents. The summer's six-part series of 30-minute episodes will reside in the same universe as The CW's live-action comic book shows, The Flash and Arrow, and will feature the voices of the same actors as they reprise their roles in animated form. Grant Gustin (The Flash), Stephen Amell (Arrow), Emily Bett Rickards (Felicity Smoak), and Carlos Valdes (Cisco Ramon) will make guest appearances. Thanks to the keen eye of Anetris on Twitter, a blurb from TV Guide Magazine's Comic-Con special was posted revealing a short tease from Arrow executive producer Marc Guggenheim, "We started off with Arrow, which is very grounded, then The Flash introduced the concept of superheroes to this universe, and now Vixen will introduce the concept of magic." Originally from Africa, Mari McCabe’s parents were killed by local greed, corruption, and wanton violence. But the orphaned Mari refuses to succumb to the terrors surrounding her. Inheriting her family’s Tantu Totem, Mari can access the powers of animals-anything from the super-strength of a gorilla to the speed of a cheetah. As Vixen, she fights valiantly to protect the world from threats like those that claimed her family. Echikunwoke, a Washington state native, has an interesting backstory all her own. She is of Nigerian royalty through her Igbo father and was raised on a Navajo Indian Reservation in Arizona. Her last name translates to "leader of men. "She's an aspiring singer and sounds like she's ready to tackle the live-action version of Vixen if and when it happens,"One thing I am really dying to do, while I'm still young and in shape, is an action movie. I would love to do a Lara Croft type of thing that's really physical and tough." If there's any justice in the world, Echikunwoke will get her wish.